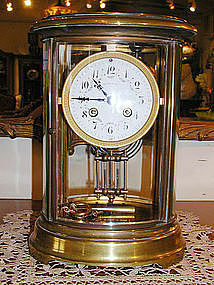 Beautiful glass and brass French clock with porcelain dial and mercury pendulum. Measures 10 1/2" tall x 7 1/2" wide x 6 1/2" deep. Porcelain dial decorated with garlands of flowers and reads Tiffany & Co. on top and France on bottom. In perfect working condition.